Among the Italian Dessert Recipes, TIRAMISU (originally Tiramesù) is without a doubt, the most famous Dolce enjoyed worldwide. Unlike most Italian well-known dishes, this dessert's origin is very recent. As with all famous recipes, there are many different stories explaining the birth of TIRAMISU, but here I will mention the one that has more evidence to probe its claim. 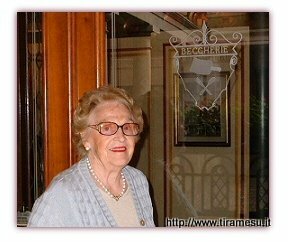 Pietro Mascioni, in 2006, visited the restaurant Alle Beccherie (in the city of Treviso, Veneto), as another step in his search for the true origin of the famous TIRAMISU. In there, he met the former owners of the restaurant, Aldo and Alba Campeol, and heard the story of their creation in the early 1970’s from the mouth of one of its main protagonists, Mrs Campeol herself. 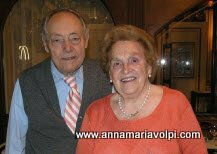 Pietro and his wife Anna María shared the story at http://www.annamariavolpi.com/tiramisu_trip.html, where you can read the whole tale of this encounter. 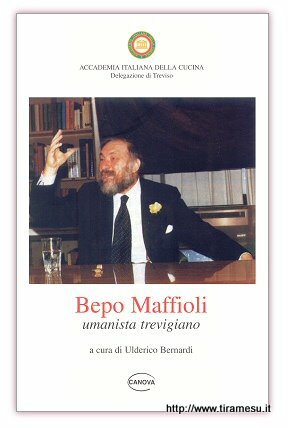 Mrs Campeol's story is endorsed by one of the region’s best known and respected Food Critics of the time, Mr Giuseppe Maffioli (Padova 1925 – Treviso 1985). This very colourful character (not only Wine and Food specialist but also a media writer and even movie actor!) described in 1981, along with Annibale Toffolo, the birth of the TIRAMISU in the issue n.1 of the magazine of which he was founding editor: VIN Veneto (see picture). 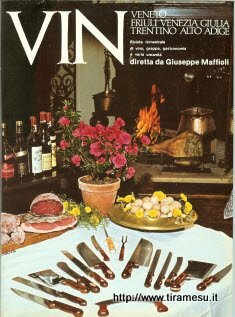 This magazine dedicated to the Wines of the Veneto region, devoted a large space to report the creation of what very soon would be the best-renowned and appreciated dessert not only of the region, but of Italy all around the world. 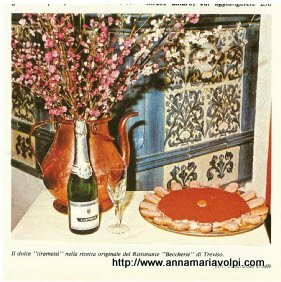 Quotes from the article, as mentioned at Anna María´s website: “In recent times, a little more than a decade ago, in the city of Treviso, a new dessert was born: Tiramesù. It was presented for the first time at the Beccherie restaurant by a pastry chef called Roberto "Loli" Linguanotto...”. “The dessert and its name, “Tiramesù,” an extraordinarily nutritious and energetic food, immediately became very popular...”.“It was, in fact, a “coffee-flavoured zuppa inglese...”. As I was reading Mrs Campeol's comments, I remembered my mother preparing a sort of zabaglione for me, my sister and my two brothers , when she thought we were needing some extra strength or energy: simply eggs and sugar, whipped into a fluffy and creamy mixture, enough to lift up the dead, she would say! My mum called it “cocktail for children”...Well, my mum’s Italian origins were responsible for that treat, I guess. So, it is not strange at all to me that Mrs Campoel’s mother-in law suggested a similar mix to lift her up! Mrs. Campeol’s story continues: “That time, my mother-in-law also added a bit of coffee to it. ‘Mangia,’ she told me, ‘It will lift you up.’ It was so good that when I went back to the restaurant, I told "Loli" (the chef of the restaurant at that time): ‘Why don’t we try to make a dessert out of this?’ And he had an idea to make layers of Savoiardi [ladyfinger] cookies dipped in coffee. Then we added the cocoa topping. It was then that I remembered my mother-in-law’s words, and we called it ‘Tiramesù." 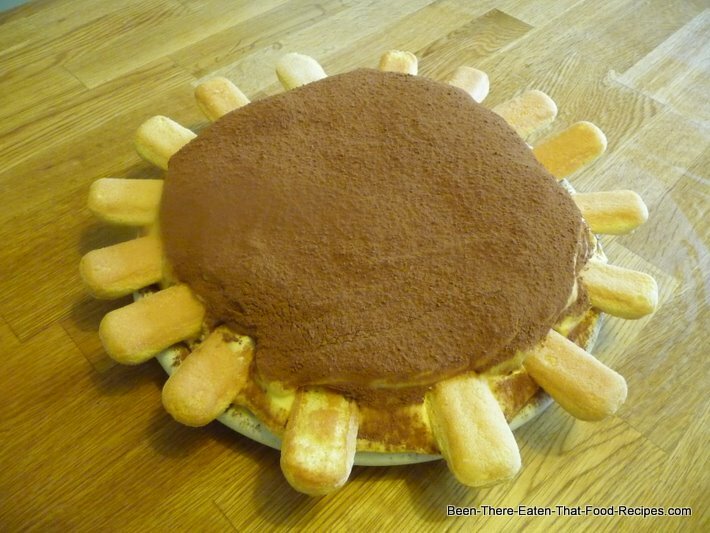 [‘Tiramesù’ means ‘lift me up,’ or ‘pick me up’ in the Venetian dialect.] “. 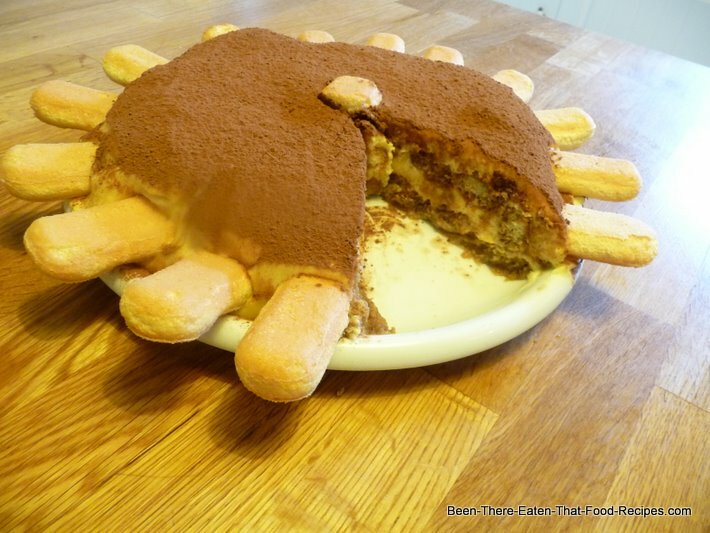 www.tiramisu.it , where you can learn more about his creation. Nowadays, you can still see evidence of this story hanging from one of the walls at the Alle Beccherie. 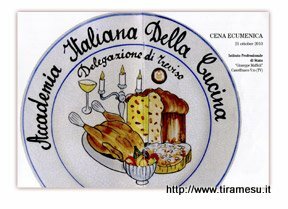 It is a certificate “From the members of the Academy of Italian Cuisine to the Campeol family, who in the ancient restaurant Alle Beccherie, continues the best tradition of the Treviso cuisine. Treviso, December 19th, 1974.” It was completed by the twenty signatures of the Academy members, including the one from the great Bepo Maffioli (as Mr Maffioli was known by). 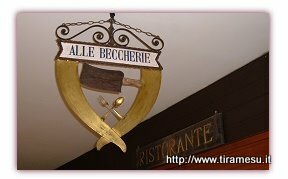 I think we can agree that that there is enough evidence to claim that the birthplace of Tiramisu was the restaurant Alle Beccherie, in Treviso, Veneto, in the early 1970’s, thanks to the work of Pietro and Anna María. 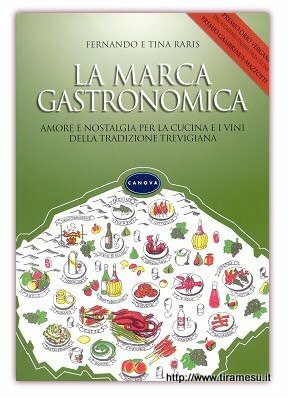 Furthermore, there is no mention of Tiramisù in any of the best Desserts Books before the 70’s , including La Marca Gastronomica that compiled a list of desserts from the Veneto, prepared by Giuseppe Mazzotti in 1964. Maybe surprising for many, today's tiramisù from Alle Beccherie remains very simple, and still true to its unassuming beginnings, even keeping the original round shape. Note: If these amounts are not in the Unit System of your choice, convert them by clicking the Unit Conversion tab on the Menu. For 6-8 generous servings, based on "Loli" Linguanotto's authentic recipe. It only takes about 30 minutes to prepare, but plan to make it a day ahead for optimum taste! 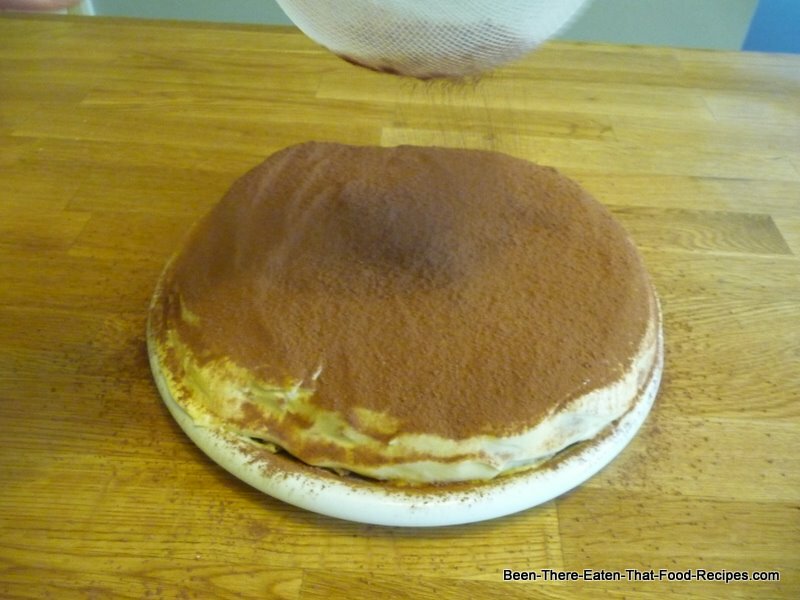 Don't be foolished by the simple appearence of this Tiramisu. This is the ORIGINAL RECIPE, as unassuming and genuine as delicious! Prepare a good espresso and let it cool down. You could prepare it with one of those fancy Espresso machines, or with the relatively inexpensive Italian Cafetiere (pictured) , but please do not use instant coffee. This recipe needs a good, unsweetened, strong espresso in it, really! 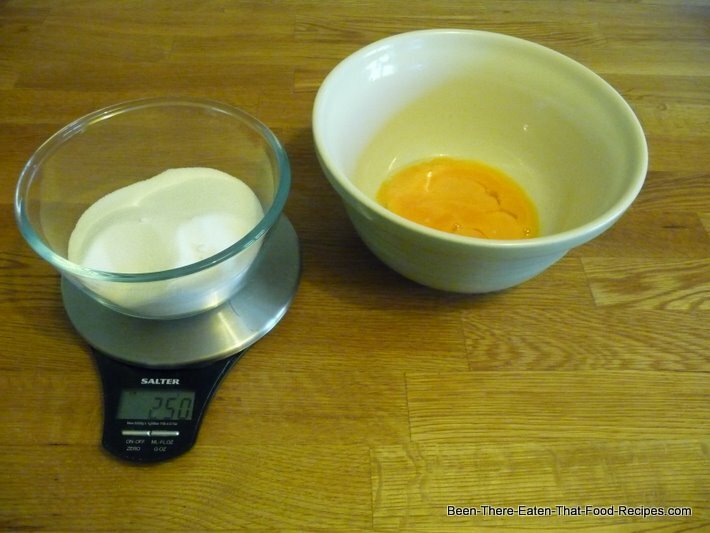 Add the Mascarpone cheese to the egg-sugar cream, and mix until smooth. Dip the savoiardi biscuits in the espresso. You must be quick, otherwise the biscuit will sink and desintegrate in the coffee! Place a layer of espresso-dipped savoiardi to cover the bottom of the serving dish. 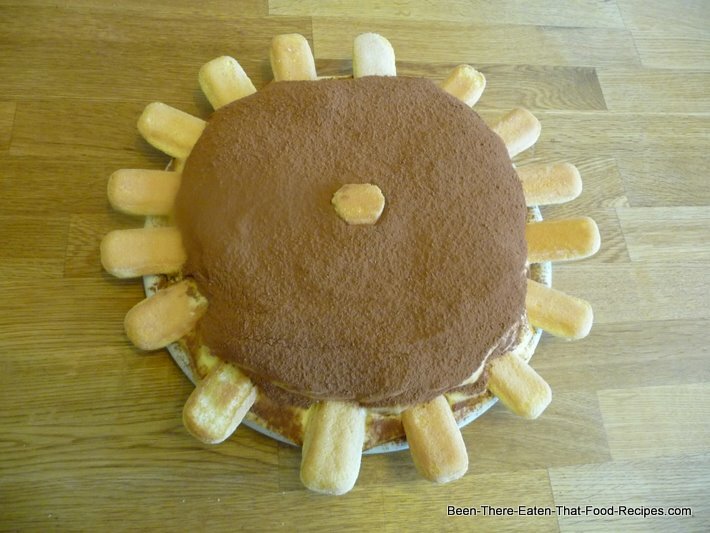 The original Tiramisu was round shaped, but you could adapt the shape to your preference. 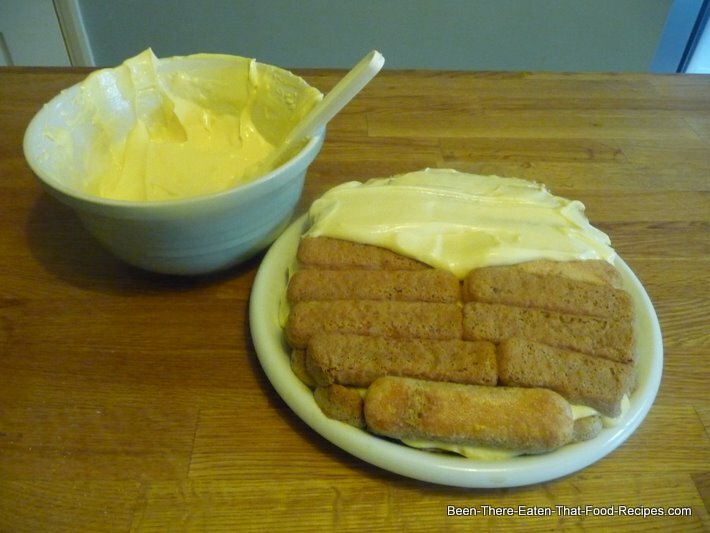 Make sure you have enough biscuits for two layers and for the decoration. 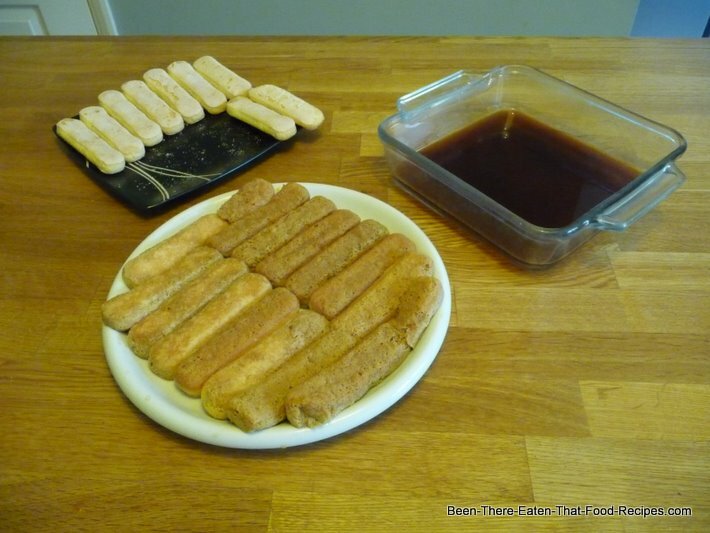 Spoon the egg-sugar cream over the layer of the espresso-dipped biscuits. 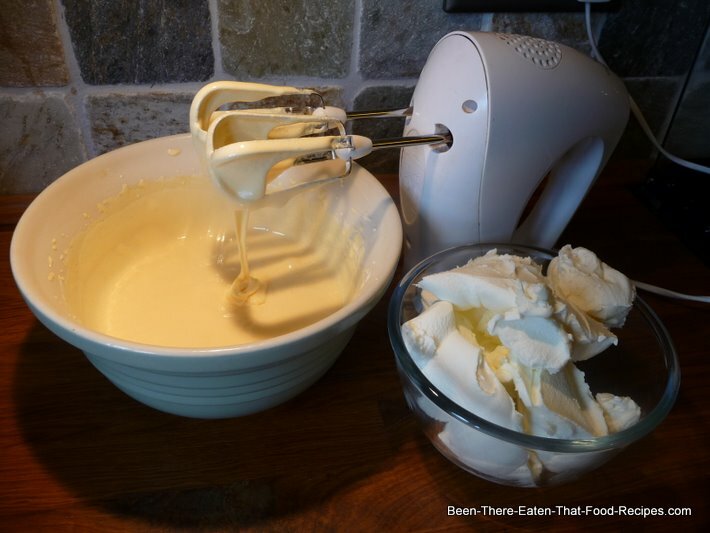 Repeat with a second layer of savoiardi and egg-sugar cream. Dust with abundant cocoa powder. Decorate with half savoiardi (not coffee-dipped this time) around the border. Now comes the more difficult part: take it to the fridge and make sure to leave it there for a day (if you can manage temptation, that is! ), to allow all the flavours to blend and intensify. Now it is ready, you will l♥ve it! !